This week I will show you some additional examples of the masks worn by Tarépiti, Maringuilla, and the Curpites in the area of Nuevo San Juan Parangaricutiro, Michoacán, also called San Juan Nuevo. I will begin with a beautiful old mask of Tarépiti, who is also known as Grandfather and San José, and which was collected in Michoacán by Sergio Roman Rodríguez of Mexico City in the 1990s. It is obviously in the style of Nuevo San Juan Parangaricutiro. The headdress is missing but there are obvious holes around the forehead for the attachment of a headdress. Today’s subjects are masks from the area of Nuevo San Juan Parangaricutiro, Michoacán that can be used in two distinctly different dances. On Christmas Eve, immediately following the Midnight Mass, they are worn during the performance in the church of the Danza de los Viejos (the “Old Ones”), and such performances continue the next day. Then on January 7th and 8th they are used in the Dance of the Curpites. In nearby towns it is the well known Viejito (Little Old Men) masks that sometimes play these dual roles, but always with the Viejitos or Little Old Men name. In an attempt to keep things clear, I will refer to Curpite masks when I mean masks that can dance as Viejos or Curpites. Here is a typical Curpite mask in the style similar to that found in Nuevo San Juan Parangaricutiro, which I purchased on EBay™ in 2005. It came without provenance, however, it resembles a mask in one of Janet Brody Esser’s books—Máscaras Ceremoniales de los Tarascos de la Sierra de Michoacán (1984, page 61, Figura 6). That mask was carved by Luis Contreras of Neuvo San Juan Parangaricutiro in 1974. 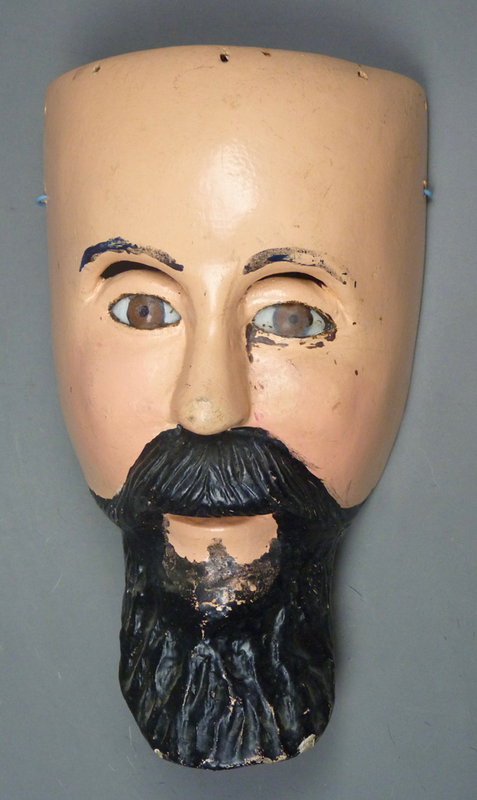 Here is that EBay mask. It is handsome and very well carved. 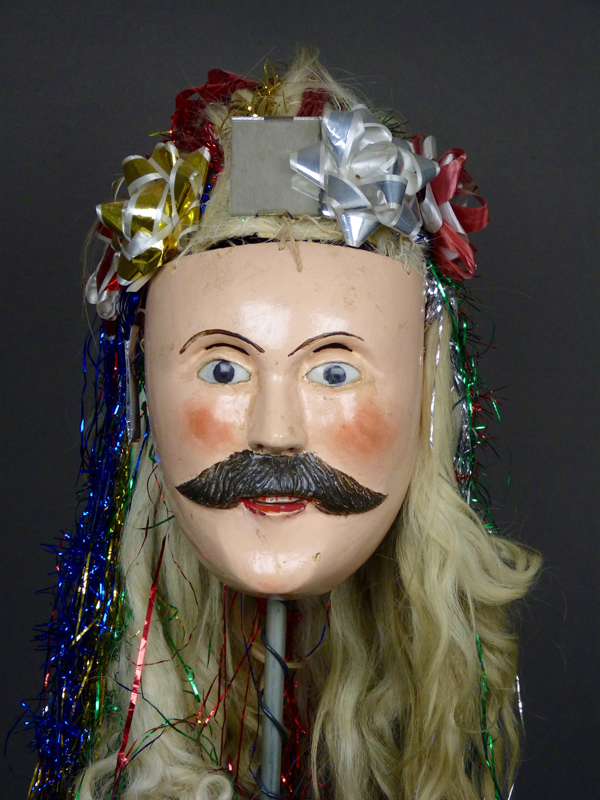 There is an attached wig, of horsetail mounted on the crown of an old hat, and this is decorated with tinsel, ribbons and a square mirror, all typical features of a Viejo or Curpite mask. 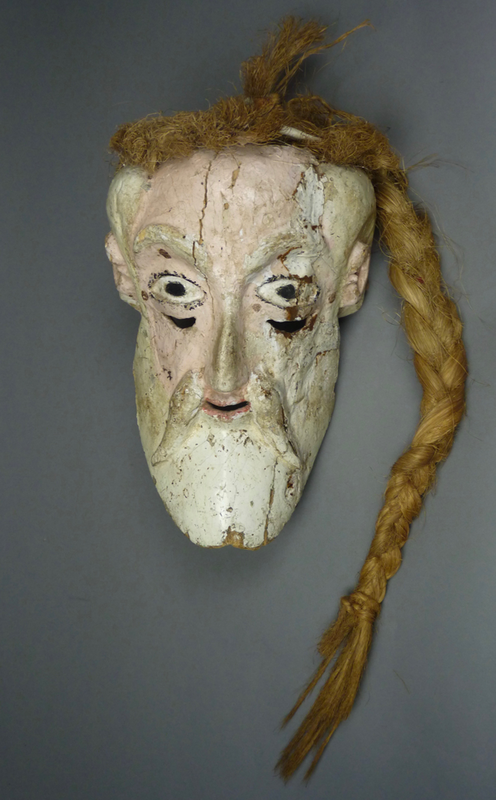 A Curpite mask always has a male face. In Nuevo San Juan Parangaricutiro and some other villages, the Curpite mask will have a mustache. In this case, and probably often, the Curpite mask will have a mustache carved in relief. The mustache on this mask is particularly beautiful. The Pastorela performance had its origin in medieval Europe, having been introduced by the Roman Catholic church as a teaching and conversion device. It portrays a very simple Christian message—”Beware of the devil, who is constantly tempting you to sin.” In this play there is at least one Hermitaño figure, a religious hermit. In the European tradition of Christian mysticism, some ascetics withdrew from society to better focus on their desire to commune with God. A very famous European mystic was Saint Francis of Assisi. The Hermitaño figure appears to have been modeled on such mystics. However, the hermit of the Shepherd’s Play is also a comic figure, alternately joking and serious. Another character from the European Pastorela tradition was Bato, the foolish shepherd. In this drama, Bato seemed to personify ordinary humans who are susceptible to temptation, prone to sin, and therefore perceived by the Church as at risk for eternal damnation. In North American and Mexican versions of the Pastorela, this character is called “Bartolo.” In the drama, the devils are constantly tempting Bartolo, he appears to be gullible, and the Hermitaño is constantly advising Bartolo to resist the devils’ wiles. Angels and archangels also participate as necessary, to limit the devils’ power. As I noted in earlier posts, these characters have been expanded, so that one finds entire corps of Hermitaños, squadrons of shepherds, shepherdesses, or “ranchers,” and choirs of Angelitos. Today I will include two more Hermitaño masks and then three that were worn by the Bartolo character. Here is the first Hermitaño. I got this mask from John Kania and Joe Ferrin, of Santa Fe, in 1998. It is from Panindícuaro, Michoacán, the principal city of a municipio of the same name, which is about 50 miles west of Morelia. This is a finely crafted mask, with almost all features carved in relief. It appears to be the work of a santero (a carver of saints), and must be fairly old, perhaps from the middle of the 20th century or earlier. The wood has split and cracked. Lagos de Moreno is a colonial city in the northeast corner of the Mexican state of Jalisco. It lies near the border between Jalisco and Guanajuato. So these masks and those from the last month or so all reflect a regional Pastorela tradition. Of course today’s masks also reveal how such a tradition can have a variety of expressions, from one town to the next and from one carver to another. I do not know the name of the carver of today’s masks, but he certainly has a distinctive and impressive style; I would call him a great master. 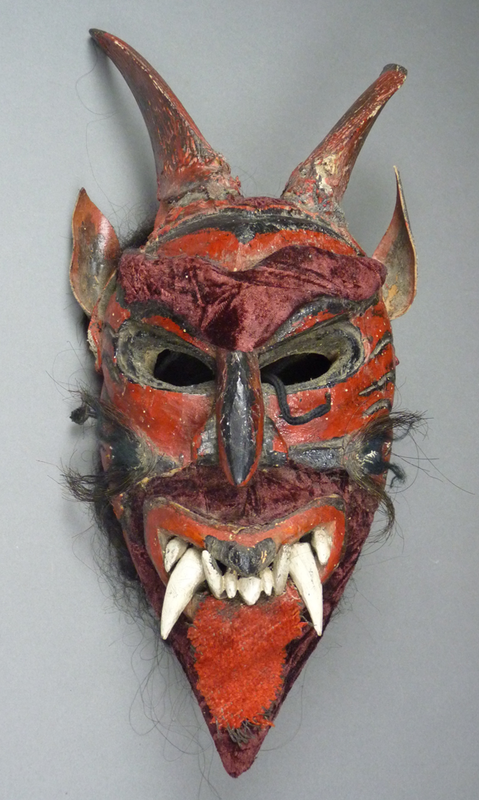 There are some additional Diablo masks by this hand in the book by Bill LeVasseur—A Catalogue of Another Face of Mexico Mask Museum—a devil on page 116 with the face of an unknown creature and a wonderful ape-faced devil on page 121. Today’s masks, three Diablos and an Hermitaño, were collected in Lagos de Moreno by Jaled Muyaes and Estela Ogazon, and I believe that they probably collected Bill’s devils there at around the same time, or perhaps he found them there himself. I purchased this set of masks from them in July of 1998. The first is a typical mask of a human faced devil, and it probably represents Satan. Magenta colored velvet has been applied over the eyebrows, above the upper lip, and over the chin. There is also a cloth tongue. There are goat horns and pointed leather ears.